What is MP4? How much do you know about MP4 video format or how to convert MP4 to HEVC? MP4 or MPEG-4 Part 14 is a container format which can be used to store video, audio and text. Common MP4 codecs include H.264, H.265/HEVC, MPEG4, MPEG-1, MPEG-2, VP8, VP9, MP3, AAC, PNG, JPEG and MPEG timed text. The widely supported video codecs of MP4 are H.264 (MPEG-4 Part 10) and MPEG4. Other video codecs are less used. As is known to all, H.264 is superior to MPEG4 no matter in compression rate or image quality. But, the new HEVC codec doubles the compression efficiency compared with H.264 (H.265 VS H.264) and it can save 50% bit rate for the equal video quality. According to test, a video file encoded with H.264 is 1-3X larger than H.265. That is to say, you need more storage space to store MP4 (H264/MPEG-4) video. This can perfectly explain why so many people wanna encode MP4 videos to HEVC/H.265 codec. And that's why this post is here, helping you decode any MP4 video to H.265 on Mac/Win in ultra fast speed and intact quality reserved. * Convert any MP4 video (H264/MPEG-4/MPEG-2/VP9...) to HEVC/H.265 with no quality loss and 5X faster speed up to 250-320 FPS, thanks to its advanced Intel Quick Sync Video and multi-core CPU utility to make best use of your PC's high-level hardware acceleration to improve HEVC conversion speed. * Transcode and convert any video (8K/4K/1080p) to 180+ video and 14+ audio formats, be it 4K MP4 to 4K HEVC, 4K MKV to 2K MP4, H265 to H264, AVI to MOV, H264 to VOB, AVCHD to FLV, YouTube to MP3, etc. * Freely edit HEVC video (trim, edit, merge, crop, add watermarks & subtitles, etc.) and adjust video parameter settings (compress 4K to 1080p, tweak video bit rate, change frame rate 30fps to 60fps, etc.). HEVC video download feature is also built-in, up to 300+ video sites supported. Step 1: Free download this program on your Mac computer (macOS High Sierra included) or download Windows version (Win 10 inclu.) if needed. Then, fire up this best HEVC converter and click "+ Video" button to load MP4 file that you desire to convert. Certainly, batch conversion is supported. 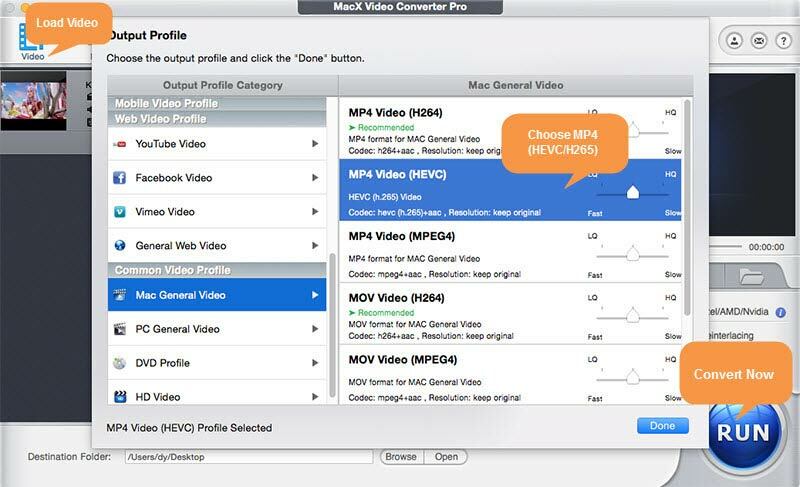 Step 2: Go to "Mac General Video" category to choose MP4 HEVC codec video or go to "PC General Video" category to choose MKV HEVC codec video as the output format. Feel free to customize your desired video resolution by tapping setting icon. 1. To improve the conversion speed, please click "Options" at the top toolbar of this best MP4 to HEVC video converter and find the "CPU Core Use" button to select the cores you wanna use for MP4 video transcode. Generally, the default setting is the maximum cores your computer supports. 2. Check if the "Hardware Encoder" option is automatically selected on the lower right corner of the interface. If the Intel QSV hardware acceleration is unsupported by your computer, please resort to another high-level computer with Intel QSV supported if you wanna accelerate H265 video conversion speed. 3. Cut off unnecessary video clips (ads, prelude, etc.) from MP4 to shorten video length via "Edit" feature. This also quickens conversion speed to certain extent. 4. In general, speed is inversely proportional to quality. Higher quality means slower speed. So to make MP4 to x265 conversion faster, you can consider to properly reduce video quality like compress 4K to 1080p, downgrade 1080p to 720p, lower video bit rate, etc. To improve the output HEVC video quality, please tap "Use High Quality Engine" and "Deinterlacing" option to improve output video quality. Step 3: Specify an output folder to save the target video file by clicking "Browse" button and hit "RUN" button to start to convert MP4 to HEVC/H.265 on Mac/Win with H.265 encoder. Just leave everything to this program and wait 1 or 2 mins for the output HEVC file. The above three simple steps are suitable for converting MTS/M2TS to H.265, AVCHD to H.265, MKV to HEVC, VOB to HEVC, etc. And in addition to encoding HEVC/H.265 video, MacX Video Converter Pro is also a professional HEVC decoder to transcode and convert HEVC video to the latest mobile device, iPhone X/8/7/6s/6, iPads, Android Samsung, Huawei, Sony, Microsoft, Google Pixel 2, Xbox, PS4, etc. 410+ device profiles for limitless playback. Feel the rush from MacX Video Converter Pro, which allows you to convert any codec MP4 video (H.264, MPEG4, VP8, VP9, etc) to HEVC/H.265, MP4, AVI, MOV, H.264 etc at Intel Quick Sync Video hardware acceleration speed, plus multi-core CPU (up to 8) processing speed. Thus, assign the MP4 to HEVC conversion task to your PC's GPU and dramatically relieve CPU for other synchronous tasks. Convert AVI to HEVC for macOS, iPhone, iPad, iMovie, HDTVs etc.